While I'm driving I always look at personalized license plates on other cars and try to depict what they mean. What do you think this license plate says? Do you see "Live to Farm" or "Love to Farm"? The first time I saw it I saw "Live to Farm" and I think that is because I've always said that My Farmer and I are "Farming to Live and Living to Farm." Well, whatever way you see it, both views were welcome at last weekend's Iowa Farm Bureau Young Farmer Conference. This was My Farmer's and my sixth year attending the conference. It has been great to see this program expand over those years. 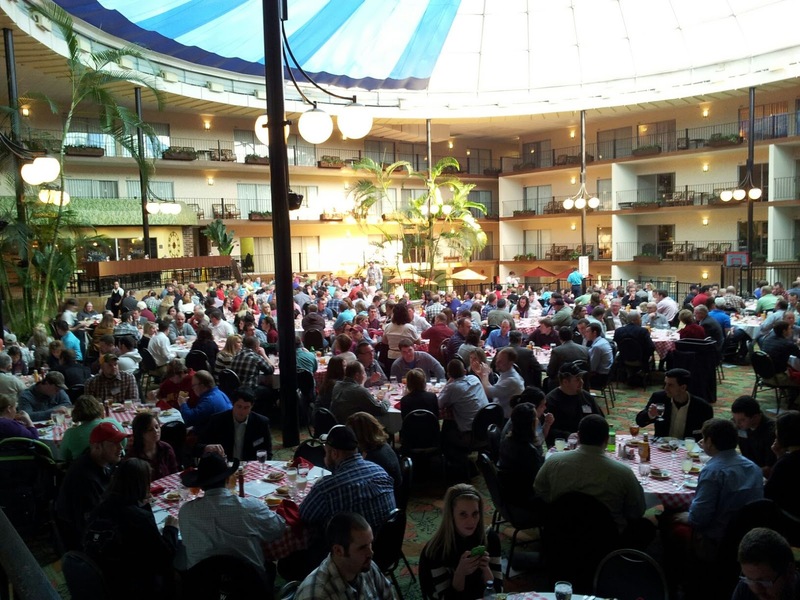 This year's conference had a record attendance of over 350 young farmers from across the state! And we were proud that our county was one of the top attendance counties with 12 attendees. Besides networking, we also enjoy the breakout sessions. This year I went to breakout sessions on "Speaking Up! Telling OUR Agriculture Story" from Katie Olthoff who is a Common Ground volunteer and I went to "Influence Those Who Influence Our Bottom Line" from Zach Bader who is the Grassroots Program Manager at the Iowa Farm Bureau Federation. My Farmer went to "Continuing Our Legacy of Family Farming" from Dr. Ron Hansen of the University of Nebraska and he went to "Healthcare & Insurance for the Future" from Deb Ferjak, a Health Insurance Manager for Farm Bureau Life Financial. These were just some of the options for the breakout sessions and we both agree that next year's conference should have three rounds of breakout sessions and not just two! It was hard to decide which two we'd go to. This year's conference also had a great group of keynote speakers - Dr. Ron Hansen and Matt Lohr gave the group some great information that hopefully left everyone motivated to start discussing succession planning with our families and to make an impact that will leave our legacy, respectively. We also had a lot of laughs with Damian Mason, as he discussed "Farm Camp." A fun side note from this year's conference for me is that I made the Top 10 for the Discussion Meet! Which means I'll have a chance to compete at the Iowa Annual Meeting Discussion Meet finals in December. The Discussion Meet helps young farmers build discussion skills, develop a keen understanding of important ag issues and explore how groups can pool knowledge to reach a consensus and solve problems. I just want to thank the Iowa Farm Bureau and the Young Farmer Advisory Committee for another great conference this year! My Farmer and I look forward to it every year. If you are a young farmer in Iowa you should get involved too. It is a great group to work with where you get to learn and have fun at the same time! I'm hoping to go more in depth in the next couple weeks on some of the breakout sessions and keynote speakers that we heard from. So keep your eyes out for more information from this great conference! I look pretty serious in that photo, but I had so much fun during the presentation! It was a great discussion with some great farmers! Thanks and sounds good! I'll plan on seeing you for the entire conference next year!